Modern steel design has evolved to become more complex than ever. From private residences to massive highrises, every steel structure relies on predetermined limits and formulas to ensure safety for its inhabitants, as well as the preservation of property. If you are in the process of starting a project, or you require help from an experienced steel structure design team in order to gain the most value and peace of mind, Sanilac Steel is here and happy to help. Since 1967, our structural steel fabricators in Michigan have worked to deliver the highest level of quality with all of our steel services. From steel design to fabrication, erection, and specialty services, Sanilac Steel is ready to get the job done in a safe, precise manner. Today, we’ll discuss the importance of limit states, as well as the value of hiring a professional team to minimize setbacks and deliver cost-effective results in a timely manner. If you’re looking for support with any of the services mentioned, be sure to contact us today! 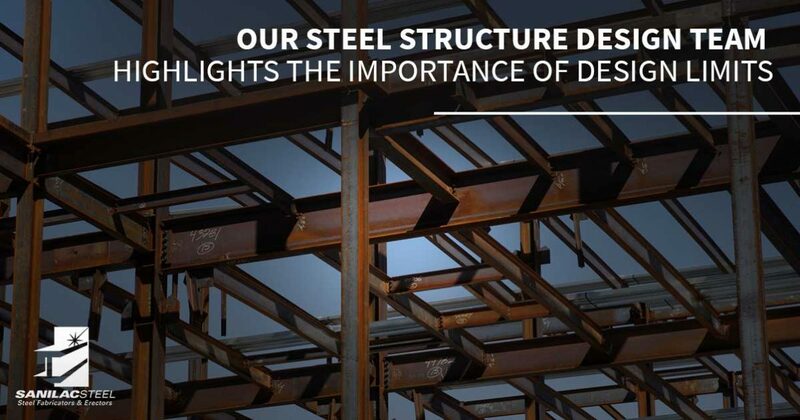 Structural steel is designed to provide strength and resistance beyond the safety minimums. While today’s designers focus on “overengineering,” steel engineering will still require the limits of each design to be determined before plans can be approved. Ultimate limit state (ULS) — This computation relies on testing and checking at the upper levels of a building for plasticity to determine the ultimate level of stress required for a building failure. In most cases, the ULS is used to determine the ultimate failure point for rare events (i.e. earthquakes). Serviceability limit state (SLS) — This equation is necessary to determine the daily stress and strain placed on a structure until a point where services or repairs will be required. The design load for SLS is much lower than ULS, because this point may be reached several times throughout a 50-year lifespan. While one limit state aims to find the point of ultimate failure, the other calculates the allowable amount of stress on a regular basis before services and repairs are required. Both factors rely on complex calculations and tests to determine the best design plan for every unique application. If you’re looking for guidance and support through this process, Sanilac Steel can help. Shear — This force acts in a direction that is perpendicular to the orientation of a building, e.g. heavy loads sitting on the horizontal access. Shearing is used to measure the force placed on support elements such as the ends of beams. Deflection — Gravity plays a large role in beam deflection, which is the changing of direction along a beam due to a transverse load. In metric measurements, the maximum deflection is limited by the beam’s length divided by 250. Fatigue — Referred to as the weakening of materials by repeated exposure to different stressors, fatigue is the result of cyclic loading strains that cause damage to occur over time. Buckling — If design weights are exceeded, steel can begin to bend and suddenly buckle. Considerable efforts are put into accounting for large compressive stresses. Bearing — The overall weight capacity of your steel will need to be considered to know how much stress the structure can bear. If the bearing capacity is exceeded, failures are likely to occur. Torsion — External and internal pressures can cause the steel beams to twist, resulting in a failure of torsion limits. Stability — A stability limit determines how much force can be exerted on each point in the building before failure occurs. Cracking — Repeated stresses can begin to cause the growth of crack formations in steel buildings. While not a common concern, corrosive environments can be the cause of sudden failures due to cracking. LRFD is needed to determine the full effects of heavy loads as well as variables in the environment to account for any and all types of failures. Properly planning and determining your LRFD will help to achieve the highest level of safety before the project has begun. Sanilac Steel is here to provide turnkey steel fabrication services from design to erection. Our team has the experience and training to deliver high-quality outcomes across the state, and we’re confident that we can deliver precise results for your plans. Contact us today to see how our structural steel fabricators can enhance your Michigan project!